I am so excited to share a BIG secret that I have been keeping!! My new book, "When Truth Refreshes: Daily Reflections from Scripture for the Emotions that Accompany the Lyme Disease Journey" will be released on May 1st, 2017!! 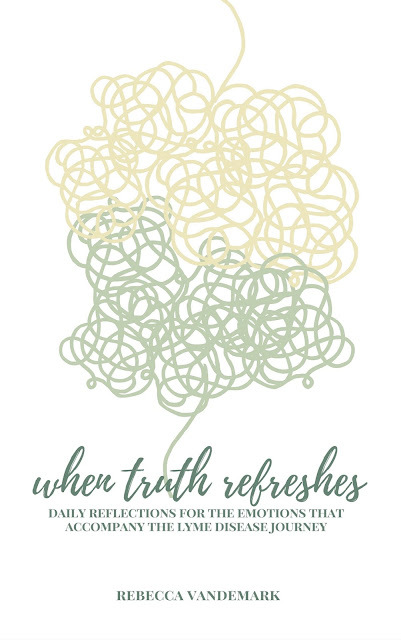 This book, "When Truth Refreshes", is the first and only Lyme patient specific book that focuses on finding truth and hope from scripture for the emotions that accompany the Lyme Disease Journey. There are 31 different emotions covered in this book to match the days of the months of the year. Each days devotion has a portion of scripture, a short reflection, a prayer, an inspiring quote, and highlights a specifically chosen song that relates to the emotion being discussed. "When Truth Refreshes" can be used as simple encouragement to those struggling through the emotional minefield of Lyme or as a guided daily devotional. Either way, "When Truth Refreshes" will provide spiritual encouragement and offer truth and hope for the emotions that accompany this journey. I started writing this specific book in December 2013 so the timing of the release date brings a smile to my face. At the time I was deeply struggling with loneliness and grief, fear, frustration, anger, hopefulness and hopelessness in addition to a myriad of other emotions when a stack of beautiful letters arrived at my front door from some former students. These letters (which I have carried with me in a special notebook and are tattered right now) spoke beautiful truth of God's love, His power to do the impossible, and His never ending mercies for each morning. Several months later, in April 2014 I had the brief opportunity to try to thank these beautiful ladies for their gift. Honestly, I was so overwhelmed with emotion of seeing these dear ladies, being back in my former classroom, and being with my former students and staff members that I loved so much that my words were so choppy and bumbled I wish I could do the entire day again. From the precious words of encouragement and love that I received afterwords, I knew though that my heart had been heard and that was a beautiful gift to my soul. "Those who are wise will take heart, they will see in History the faithful love of the Lord." Throughout the last couple of years I continued to write this book, more than on the slips of papers, napkins, mediation bags, doctors notes, and lab results, but on my heart. Over the course of time in hospitals, doctors offices, treatment sessions, from my bed when I couldn't sit up, the theme of this book and the truth that I was writing was being imprinted on my heart and soul. "Every day you preach to yourself a gospel of your loneliness, inability, and lack of resources or you faithfully preach to yourself the gospel of the Lord Jesus Christ." I need to do this. I needed this book. I needed to be reminded of the truth of the gospel and the hope that comes from that. I need to preach to myself the gospel of Jesus Christ and the tender mercy that meets me in my emotional distress. The timing of finalizing things with this book release and finishing up last minute items with this book has not been lost on me. This journey through this disease has brought a myriad of different emotions: excitement at the progress of healing that I am slowly experiencing, joy at finding a wonderful and experienced medical team to help me, anger over the lack of understanding and support in the political arena of Lyme, discouragement at the extreme lack of energy I have and the way that fighting Lyme Disease prohibits me from living life fully the way that I wish I could, regret, anger, frustration, and sometimes hopelessness at feeling this journey will never end. These past 7 weeks alone brought unexpected changes and this week's decision to halt and stop some treatment and news that was completely unexpected to me and another delay in this long road of healing is enough to bring on the deep emotional waves. My heart was broken again and I have cried more tears, found myself discouraged again, and have laid out my broken heart once again to the One who loves me more than life. But this past week in many ways is once again reflective of the entire journey... and in many ways life. Our emotions can shift and change and there can be times of hardship and grief and times of highs and joy but truth refreshes even the weariest of emotional droughts. As I approach another anniversary of when this season began and everything was shattered, I look back on the now tear-stained pages of my Bible with a soft smile. An understanding of truth that has refreshed my soul. Of knowing how my emotions have been met with grace and love and hope, especially on days where I felt I could do nothing but weep. My prayer with this little book is that it will encourage anyone who reads it, lead them to scripture, remind them that they are not alone in this fight, and gently remind them that the God of hope and truth is very present and active in this often emotional journey. May the Lord bless you abundantly dear friends and give you strength for the journey's before you and may we find everlasting hope in our ever present and faithful Savior. "Guide me in your truth and teach me, for you are God my Savior, and my hope is in you all day long." When Truth Refreshes was released on May 1st, 2017. You can purchase it where books are sold and on Amazon HERE. Rebecca, where will we be able to purchase your book? Amazon? Hello! "When Truth Refreshes" will be available where books are sold and on Amazon! It will be released on May 1st! Thank you so much for your message! !